Industrial Blank Tags ship in 2 days. With Industrial Blank Tag Quick Ship service, customers can order sets of 100 blank stainless steel tags, up to 10 sets, and they will be shipped within 2 business days. Tags come in 1 x 3, 1.25 x 3, and 1.5 x 3 in. sizes with type 304 2B finish, which is dull, non-magnetic, and non-corrosive. With two 1/8 in. holes on right and left side, tags can be attached to equipment, pallets, shelves, and other assets.Â Users can stamp or engrave serial numbers, dates, inspection checks,Â etc. Get Your Blank Tags Fast! National Band & Tag’s newest service for the industrial marketplace is the Industrial Blank Tag Quick Ship! This new service allows customers to order sets of 100 blank stainless steel tags, up to 10 sets (1,000 tags) and they will be quickly shipped within two business days! As a manufacturer we produce all our tags in house, and it typically takes at least a week to manufacture blank tags. But we listened to our customers and we responded, with a way to get your blank tags faster! We currently have three different sizes available for the quick ship service: 1” x 3” inches, 1.25” x 3 inches, and 1.5” x 3” inches. Our .030” stainless steel tags have a type 304 2B finish, which is dull, not attracted to magnets and is non-corrosive. Tags also come with two 1/8” holes on the right and left side. This is our most popular hole size and is great for making tags easily attachable to pieces of equipment, pallets, shelves, and other assets. Blank tags allow you to stamp or engrave your own information on site when you need it, such as serial numbers, dates, inspection checks, inventory counts, and more! 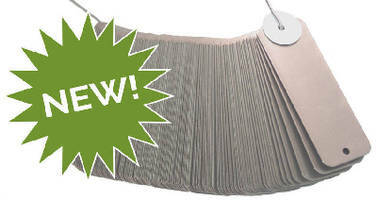 Click Here to be taken to the online order form for the Industrial Blank Tag Quick Ship!